An example of the Apple IIe “strip-chart” display (received power vs. time) from the Poplar Springs Radiometeor Station. This station operated from 1993 to 1998 in northwestern Florda. Whenever a meteor passes through the upper atmosphere it creates a column (actually an elongated paraboloid) of ionized air behind it tens of kilometers (km) long, called a meteor trail. Occurring at an atmospheric height of about 85 to 105 km (50 to 65 miles), this ionized trail is capable of reflecting radio waves from transmitters below on the Earth’s surface. This type of reflection behaves very similar to light reflecting from a mirrored surface, and is called a specular reflection. Meteor trail reflections are brief, however. As the trail rapidly diffuses into the surrounding air, it quickly loses its ability to reflect radio waves, causing most reflections to last less than 1 second. Occasionally, a large meteor may create a trail capable of reflecting radio waves for up to several minutes. Meteor radio wave reflections are also called meteor echoes or events. If the radio waves from the transmitter below strike the meteor trail at a perpendicular, or right angle, then the reflected signal will be directed back towards the transmitter itself. This is called back-scatter, and a station set up to receive such signals is called a meteor radar. Back-scatter is one of the most common methods by which professional astronomers study meteors using radio waves. These reflections can be used to study the meteors which caused them because each meteor will generate a unique signal based upon its mass, velocity, angle and direction of entry into the atmosphere, and distance from the transmitter. Current research of this type is being conducted using the powerful Arecibo Radio Telescope, located in Puerto Rico, to study extremely small micrometeors. If the radio wave from the transmitter strikes the meteor trail at some incident angle other than perpendicular, then the reflected signal will be projected to some point on the ground some distance away from the transmitter. This is called forward-scatter, and the area on the ground where the signal has been reflected is called a forward-scatter footprint. This footprint will only be a few km wide and several km long. Meteor trails can reflect radio signals over distances of up to 2000 km (1200 miles) between a transmitter and receiver. most forward-scatter systems, however, operate at a distance of about 300 km to 1500 km (175 to 925 miles). First, the trails can be used to send brief encoded messages to distant receiver sites. This is called meteor burst communications, and is frequently used as a backup means to satellite communications. In North America, the most widely known meteor burst communications system is the SNOTEL system, used by the U.S. Natural Resources Water and Climate Center, located in Portland, Oregon, to monitor rain and snowfall levels at remote stations throughout the Rocky Mountains. These stations are fully automated weather stations and meteor burst transceivers, which relay their information to a master station upon command. In addition, amateur radio enthusiasts, operating in the VHF bands, also make frequent use of meteor scatter (MS) , during major meteor showers. The second purpose for forward-scatter is the study of meteors, and is similar to that performed by the back-scatter systems. The advantage of this method is that transmitters broadcasting for purposes other than meteor radio scatter can be utilized, thus allowing the construction of a receiving station only by the researcher. The disadvantage of this research method is that the geometry is much more complex than in the back-scatter condition, making meteor parameters more difficult to determine. Through the use of commercial radio transmitters, amateur astronomers have also begun to successfully establish forward-scatter receiving stations of their own. While most of these amateur stations are for the purpose of enjoyment only, a handful of stations have been established for the purpose of collecting data usable by the professional astronomical community. For nearly forty years the American Meteor Society (AMS) has encouraged its amateur members to experiment with the establishment of forward scatter receiver systems. First successes in this area were had by the Kansas Meteor Group, an AMS affiliate, in 1958. This group, led by Walter Scott Houston, established an automatic electronic system for counting meteor echoes from a professionally operated transmitter located in Cedar Rapids, Iowa. Featured in the July, 1958, Scientific American, this system remained in operation until the early 1960’s. During the mid-1970’s, the advent of the personal computer made it possible for amateurs to establish forward-scatter data collection systems of an even higher level of sophistication. In order to germinate this potential within the amateur community, the AMS Radio Scatter Program was created by Dr. David Meisel in 1977. The purpose of this program was to establish a network of amateur operated forward-scatter receiving stations across a wide geographic area, each station automatically collecting data on the incoming meteor flux on a continuous 24-hr day basis. The data collected from these stations would then be used in the research conducted by AMS affiliated professional astronomers. 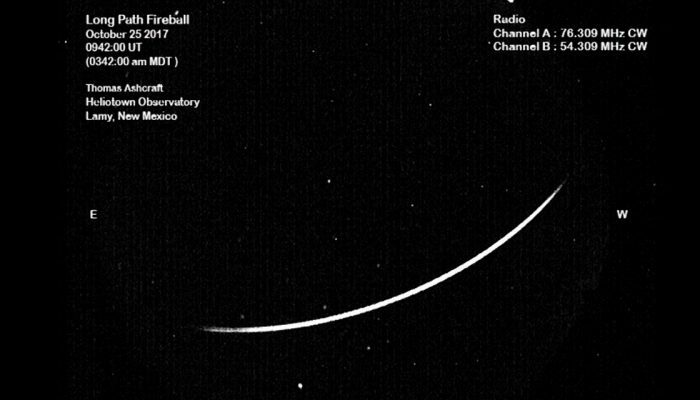 During the decade of the 1980’s, this program carried out experiments involving the establishment of meteor radio scatter receiving stations by groups of amateur astronomers, as well as preliminary work in using microcomputers for data collection. Notable successes included the work of William Black (1983) of Florida; Michael Owen (1986) of New York; and Meteor Group Hawaii, led by Michael Morrow and George Pokarney (1987). The most promising results were the experiments performed by Kenneth Pilon (1984), a Canadian amateur, who successfully demonstrated that a TRS-80 personal computer could be used to detect and make graphic printouts of meteor events. Building upon the lessons learned from these previous attempts, the first full-time prototype station for the AMS became operational in March, 1993, utilizing an economical Apple IIe platform for data collection. This station was located in the rural countryside of northwest Florida (Poplar Springs) , and utilizes distant Television Channel 2 transmitters as its signal source. In late 1993, the AMS Radio Scatter Program was reorganized, and became the AMS Radiometeor Project. For several years, efforts were focused upon expanding the network, as well as increasing the reliability and sophistication of each individual station. Three stations were eventually established, located in California, Florida, and Virginia. Professional analysis of the collected data yielded several conference talks and an extensive paper in the European journal Planetary and Space science. By 1998, the data collection computers were significantly obselete to make further operation impractible, and the network of active stations was discontinued at that time. Although the AMS does not currently have an active network of radiometeor stations, the society continues to support amateur efforts in this fascinating aspect of meteor science. For further information, see the links below. Meteor and Colorgramme, an automatic radiometeor detection (Meteor) and display (Colorgramme) software package developed for the PC platform by Pierre Terrier and Philippe Boeuf respectively.